Buying a sofa bed can ensure that you always have a comfortable place for your guests to sleep. You don’t have to worry about moving the kids out of their beds or putting people on the uncomfortable couch. Everyone can have their own, comfortable space for a great night’s sleep. The right sleeper sofa can also help you make the most out of your space since it can be used in a room that serves another purpose, such as a playroom, a home office, or a den. You can even use a sofa sleeper in your bedroom so that it doesn’t feel so crowded during the day. Fortunately, there are so many more options for couch beds than there were in your granny’s day. You aren’t relegated to gaudy florals and plaids or paper-thin mattresses. You can find luxurious sofa beds in Vancouver that have plush, memory foam mattresses and that are as chic as anything you’d find in a magazine layout. When you think of a couch bed, you probably think of the traditional pull-out model that made you struggle to get out the mattress and then scramble to find a place to put all the cushions. Plus, you had that huge gap between the top of the mattress and the back of the couch. Nowadays, there are more sophisticated sleeper sofa options that solve all of those issues. High-quality sofa beds pull out with one smooth motion, and they have no gap between the top of the mattress and the couch. Some even have the cushions attached to the platform so you don’t have to manage them at all. The futon is another popular sofa bed type. 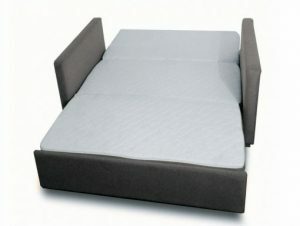 The back of the futon lays down flat to create one surface, turning the seating cushion into a bed. 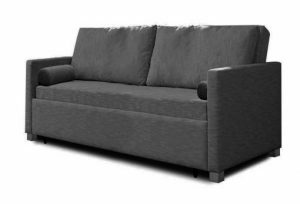 There are flimsy futon options that you’ve probably seen, but modern sofa beds use the futon mechanism for a more sophisticated looking piece of furniture. What looks like a typical couch has a folding back that lays down to reveal the sleeping area. Finally, there are more advanced options that have unique mechanisms. For example, the Harmony beds at Expand Furniture have a seat back that lays down like a futon, but the mattress folds open in a way that feels familiar but is still different than the traditional couch bed. The entire mechanism is so easy to use that even a child can manage it. Of course, the mattress type on the sofa bed will have a huge impact on the quality of the sleep it offers. Traditionally, sleeper sofas used thin, innerspring mattresses that were not very comfortable. These mattresses usually popped a spring or caved in on their own supports, leading to metal pieces poking sleepers in the back or the mattress feeling so thin that people felt like they were sleeping directly on the metal frame below. Today’s sleeper sofas still use innerspring mattresses in some cases, but they are of higher quality and much more advanced. When you buy a high-quality sofa bed with an innerspring mattress, the supports will hold up over time, and the cushioning will be enough to give you or your guests the best night’s sleep. The best sleeper sofas have memory foam mattresses. The memory foam conforms to your body so that it hits you exactly where it needs to, providing support on your pressure points and giving you a soft, pillowy surface on which to sleep. With a memory foam sofa bed, you’ll feel like you’re sleeping on a cloud. All of the Harmony sofa beds at Expand Furniture have memory foam mattresses. Sofa beds used to come in pretty much one size. These days, you can get king sofa beds, queen sofa beds, and even single or twin sofa beds. You can get a sofa bed that fits the space you want perfectly and provides just enough sleeping room for the guests you anticipate. For example, you can use a Harmony single sofa bed as an accent to another sofa bed in a living area, or you can use it in a child’s room to have ready for sleepovers. It is important that you shop for a sofa bed that has the highest-quality materials you can afford. The quality of the materials will directly influence the comfort of both the sofa and the bed inside it, as well as the longevity of the sofa bed. 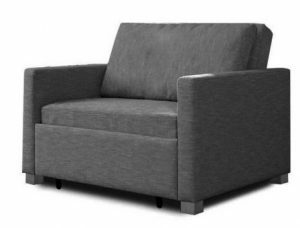 Look for sofas made of real wood, high-quality steel or other metal, durable fabrics, and high-density foam. Always read the specs to know exactly what you are getting. Don’t make assumptions about the materials just by looking at the sleeper sofa – low-quality materials can make pretty good imitations. A sleeper sofa doesn’t just need to be comfortable; it also needs to look good. After all, it will be a sofa most of the time when you don’t have guests sleeping on it. Browse the range of options to find the perfect design for your space. Some sleeper sofas include custom options, such as different fabric types, colors, and even accessories like shelves. Either find a design you like as is, or work with a retailer that allows you to customize. When you put together all the right elements, you get a perfect sleeper sofa that looks beautiful in your home and is just as comfortable as any bed you’ve ever slept on. Expand Furniture has a wide selection of high-quality, designer sleeper sofas to help you accommodate guests and maximize your space. Our beds are designed to help you make dual use of any room, ensuring that you have a stylish seating area as well as a comfortable sleeping space. Many of our sleeper sofas include customization options so you can get just the look you want. Browse our online catalog and find the right sleeper sofa today. Contact us today!